A sophisticated 9ct gold signet ring featuring subtle diamond detailing for a touch of indulgence. 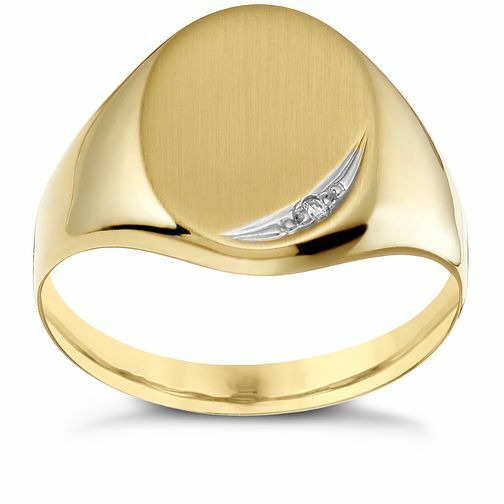 9ct gold diamond set oval signet ring is rated 1.0 out of 5 by 1. Rated 1 out of 5 by Anonymous from Cheap quality with sharp edges This was a Xmas gift for my son but was a big disappointment. It's very lightweight, has sharp edges and feels very 'unfinished'. It's neither sophisticated nor indulgent! It left a sore dent on his finger after just a few minutes. We've taken it back and the staff were most helpful, but we ended up with a refund as no suitable alternative.